Awhile ago I cam across a very cool peice of 40k art for Fantasy Flight Games and their Inquisitor series of RPG books. The work reminded me heavily of Inquisitor Eisenhorn’s agents, their close fitting outfits and rigs and more advanced classic 40k weapons. I had always wanted to create a model based on this figure. 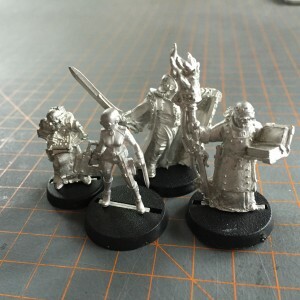 Turns out, Andrew Rae, of Statuesque miniatures did the hardwork for me. That’s Santana (left), of the Pulp Alley range of miniatures. 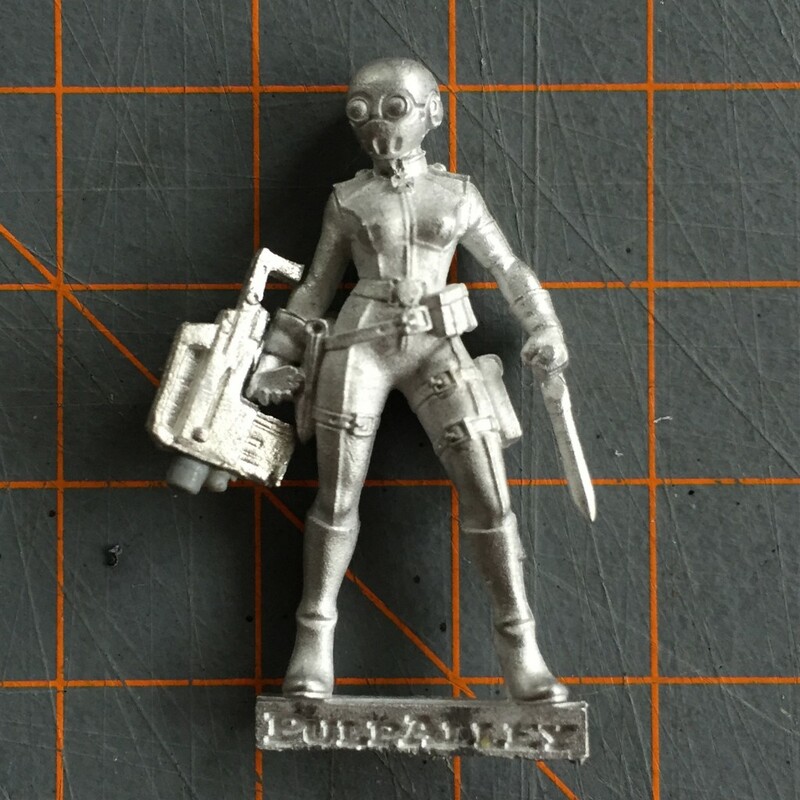 You can buy her, as part of a dual pack, here. Looking at Santana again, the resemblence is striking, when reviewing the concept artwork. I should mention, Andrew was as interested as I in seeing this evolve also. 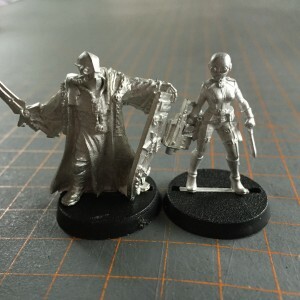 He sent me two head sprue from his Heroic Scale range to try out some ideas. For the life of me, I couldn’t bring myself to behead Santana, Andrew’s original work was her, ready for combat. 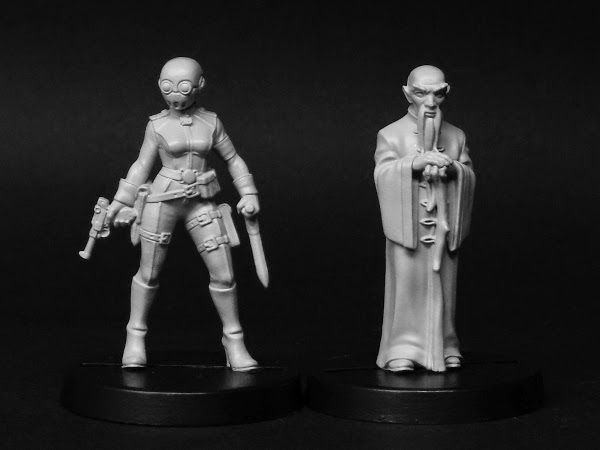 However I did use one of the heads to begin work on a female hero from a gaming friend and the bare heads will be going toward other conversions with due credit to Andrew’s generosity each time. Thanks Andrew! You made a close friend of mine very delighted, thank you Sir! A bit lost for ideas, I checked my bits box(es). 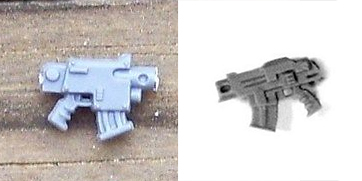 I had a Capitol figure from Mutant Chronicles (eBay Lot random) which had a carbine that I noted, once removed and recut, looked like a slim line advanced Bolter-Carbine after added muzzle. So in fitting with Santana’s slim build, I was able to put in a recognisable weapon profile to suit. 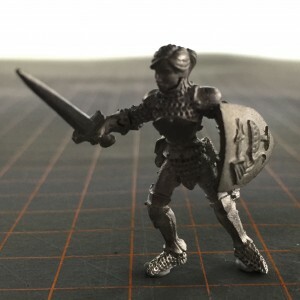 As opposed to the thuggish Inq28 Crusader for example, her lithe form is not out of place scaling wise – she’s the prowling stalker to his bullish powerhouse. I can almost hear her discussing mission goals with Eisenhorn. It’s nice to see you picking up steam again. Forgot to say: I really like the conversion, the base figure I a great find! Thanks man :) Bit of a weapon swap so far – just couldnt bring myself to chop that very cool faceplate :) More adventurous modelling shortly. Indeed, one heck of a lucky find! Hey SJ! This piece of art also struck a chord with me and I’ve been looking for a suitable model to convert. So happy I found this here on your site!